Ha, I can see the "fries" already. I say it that way because I don't believe they are fried (or salted) but they are indeed potatoes. Hopefully they won't be gross though a lot of people do swear by dipping french fries in a frosty or shake. I dig in and thankfully it's not a weird experience. I know the stronger of you out there just dove right in without fear, but others like me might be a little hesitant. Thankfully it was a pleasant experience. The malt manages to sneak in to the overall flavor while there is no overpowering potato flavor that hit me this time around. For the most part the fries are fairly short (which is fine because you want them to fit on your spoon). What surprised me was that I don't really remember hitting any chocolate malt balls. I remember hitting small pieces of chocolate, but nothing that struck me as a malt ball. Could it be some kind of malt chocolate chunk? I do not know because I was busy scooping instead of examining. I mean I looked, but I didn't actively start scooping around specifically for the malt balls. I will have to try harder tomorrow. Overall a decent first impression thanks to a fairly mild flavor profile. I feel like this could have easily been weird and it wasn't. We'll see how the second scoop holds up. 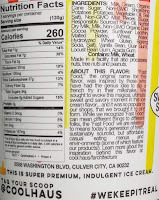 On Second Scoop: I hate to pick on a new flavor, but.... this one bores me. I prefer the bites that have a chocolate factor to them and there just aren't many of those bites. This flavor is a malt flavor more than anything, but because I'm not the biggest fan of coolhaus texture, it just doesn't work for me. [Their texture seems overly gummy to me, though it's high end gummy rather than say Breyer's gummy]. I know not everyone is bothered by odd combos of flavors and textures, but I am. Unless you are really in to malt or coolhaus, I say save your money. Added note: I forgot to mention that the chocolate "chunks" were the chocolate that had separated from the malt. I took a picture but you really can't tell the color difference between the malt chunk and the base ice cream. Final Note: I posted this on instagram and the majority of people who responded really seemed to like this flavor. On the other side, the minority were underwhelmed like I was. I wound up crunching up two bite size butterfingers onto my last serving. So, what side are you on? I agree on the underwhelming-ness of this one. Already being rather "out of the box" to begin with, I was hoping for more drastically contrasting mix-in flavor--as in I truly wanted those fries to be crunchy and salty! My pint did have a good share of malt balls though. It's funny, but a lot of them were "camouflaged", as the chocolate coating had separated into those little shards that are throughout the rest of the pint. Doh, totally forgot to show the picture of the malt bits without their coating. Definitely a weird side effect on this one. I was thrilled when I saw this brand at my local grocer. I tried the churros flavor and was majorly disappointed with the pintvoverall, esp for the pricepoint. I liked it! Then again I’m a big malt fan and I didnt even really notice the maltiness but since you mention it that could be why I enjoyed it so much. They could have gone bolder with more salt on the fries. But overall it worked for me. I have another one of the new flavors from them (the French Toast one) that I’m eager to try. But I’d buy this one again for sure. 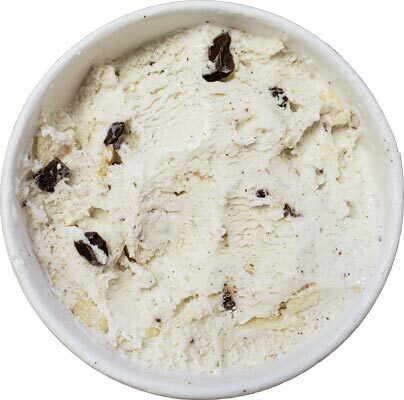 Are you going to go to your nearest Ben & Jerry's Scoop Shop to try the latest Shop-exclusive flavor? 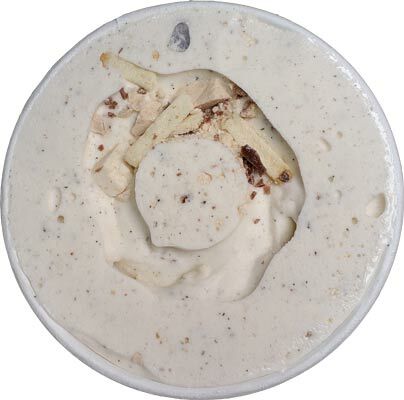 It's a Phish-themed ice cream with a caramel malt base, toffee almonds, caramel swirl and the same fudge fish that "Phish Food" utilizes. I'm usually not big on caramel and I don't even like "Phish Food" but I enjoyed this flavor a whole lot more than I expected to. The based and the toffee-coated almonds were the best parts as they reminded me of eating milk-soaked sugary cereal of my childhood (I don't eat sugary cold cereal anymore) the dark fudge fish complimented it all well and kept it from getting too sweet. 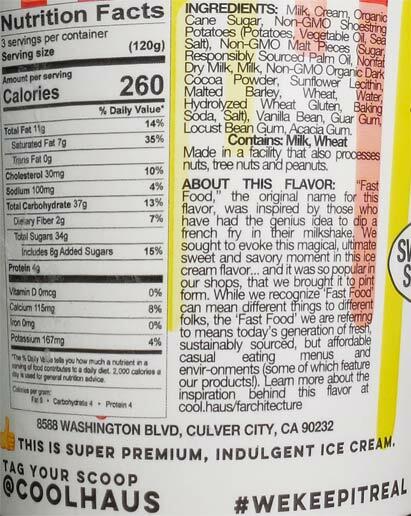 I would've liked more malt flavor though. At almost 7 bucks a pint buying it again isn't really a priority but if I go to the mall on Monday and see it again, I will get it again. 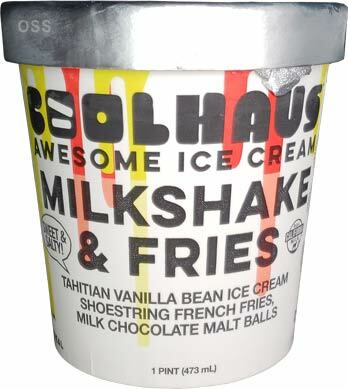 As for this Coolhaus flavor : I only ever see the sandwiches rarely a pint, so I probably couldn't get this anyway but it's not my thing at all. Fries go with burgers, and fried fish, not milkshakes. FYI to those who may not have had a shot at Coolhaus, Aldi will be selling some pints this next week. @D: flavor, texture, or both? @Anon: i want to say several things but will condense it to: my job use to be two minutes from a B&J's scoop shop but no longer, so I doubt I will be trying the new Phish flavor. Hey Dubba, were they weird white chalky-ish bits? I emailed you a few weeks ago about a strange find in a bourbon ball ice cream and I’m wondering if we experienced the same thing—bourbon/malt balls falling apart in the ice cream so the chocolate shell was separate? Wow really?! That’s crazy. I will have to keep an eye out. My Aldi breaks their ad weeks from Wed-Tues so do you mean this Wed coming week (June 20-26) or next (June 27-July 3)? Oh geez, yeah, the chocolate separated from the malt here as well. Had I tried this before you sent the picture, it may have made more sense. Something to look out for in the future I guess! Right now, saw them yesterday. I just got a pint. Will give it a go!